Ultimate Knitting Terror: Will I Have Enough Yarn? (Answer: Yes.) | Knit Like You Mean It. Sweater Quest, by Adrienne Martini. A whole year on one sweater?!? When last we spoke, I was busily giving away my stash, and trying to decide whether to rip back to add some length to my Schieffelin Point Shawl. And then…then I read Chapter 3 of Sweater Quest by Adrienne Martini (isn’t that a great name?). For those of you who haven’t picked up the book, Martini decided, after knitting for a few years, that she’d climb what she calls “knitters’ Mount Everest” – the Mary Tudor sweater. First she knits a hat with her left hand to prove she can do the left-hand/right-hand fair isle thing. Then, to get the pattern for the sweater, she buys the book Tudor Roses on eBay for an ungodly sum. And then she goes on an epic quest to find the right yarn for the sweater (the original yarn has been discontinued). An EPIC quest. This is where I got scared. Here is a woman who is hunting down really specific yarn via panicked phone calls to Canadian yarn distributors and sad e-mails to Ann Shayne (lucky girl, to be a Friend of Ann! )…am I making a mistake, giving away all this yarn? I mean, Danielle told me not to, and Danielle talks like she knows everything. What if she does? What if I need some of the yarn someday? What if…some of it gets discontinued?!? Rowan Yarn: Already Discontinued. Oh no! Comment on this post for a chance to win. We are lucky that I was on the cross-trainer at the gym when I had this thought. The cross-trainer doesn’t pause to let you lose your mind and breathe into a paper bag over possible yarn losses of the future. Indeed, I was already breathing pretty hard, what with the cross-trainer being the most sadistic of cardio machines at the Monroe Street YMCA. At any rate – I reminded myself that I don’t need the yarn, that there is yarn in England, that I cannot ship all the yarn to England because customs would probably detain it, thinking I was planning to tank the wool market by dumping the entire stash into the UK at once. Also, that giving the yarn to deserving homes is fun, which it is, and has introduced me to you good people. Most of all – that you people are worth it. You people deserve the yarn! Huzzah! Canopy Worsted wants to come home with you. As if to reward my return to sanity, Sweater Quest had some reassurance for me, too. When Martini hit a wall in her quest for one of the 11 colors of yarn she needed for the sweater, Shayne had the yarn she needed. Before that, when Shayne was looking for a similar color to knit the Keava sweater, a stranger in New York sent her an entire box of yarn so she could select exactly the right shade she needed. One of Ravelry‘s first features was a way to post yarn one’s stash with a “will trade or sell” icon so knitters could find the right yarn, in the right dye lot, to help knitters who didn’t have enough yarn to finish a project. Knitters take care of our own. Here’s a nice (and recent) example. It’s about a month until I move, and anxiety is starting to set in. One thing that’s keeping me from just lying curled in a tiny ball and hiding (possibly while rocking back and forth) all day is knowing that I’ll be part of a community of knitters when I get there. From Sophie of the Knitted Maze (premiering this weekend!) to Gerrard of I Knit London, the knitters I’ve met in the UK have been as generous and friendly as knitters here. 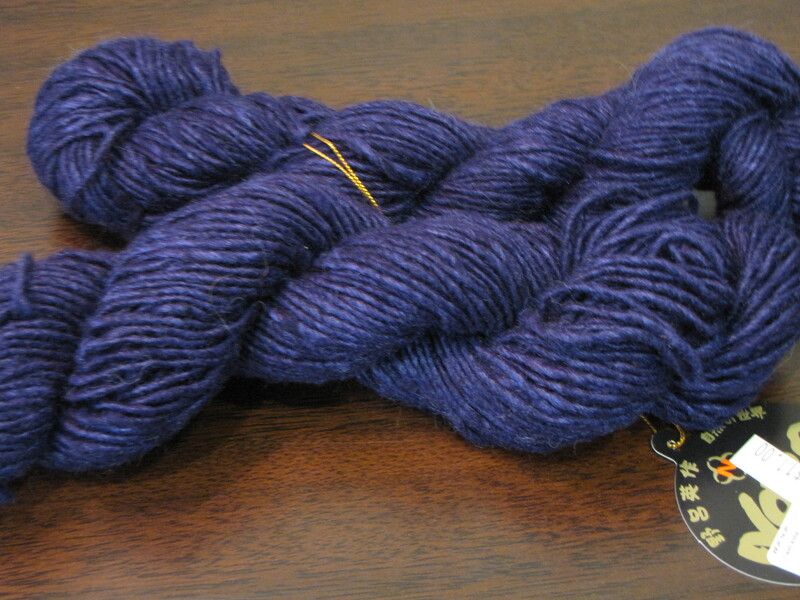 Noro Cash Iroha: soft, with a yummy sheen and gorgeous purple color. You know you want it. What’s more, I found an amazing retreat that’s happening in the UK this fall – the Plug + Play + Pembrokeshire, with Brenda Dayne and Amy Singer. Yes, THAT Brenda Dayne, and THAT Amy Singer. Can you believe it? I immediately tweeted that I wanted to go, but needed to convince Mr. Trask. Over the next few minutes, both Brenda and Amy sent me tweets asking what Mr. Trask likes to do, and then gave me scads of information about where to send him and how much he’d love Pembrokeshire. Brenda! and Amy! Tweeting to me! I am such a fangirl. Long story short (too late): we’re going. Join us! Mr. Trask will hike, visit castles and other historical sites, and write his little heart out. I will learn Amy’s spiffy “plug and play” design method and knit with 19 other knitters in the gorgeous Beggars Reach Hotel. Two lots (for two different lucky winners) of Rowan Lightweight DK: the greens at the top of the photo (above), and the pink/blue/charcoal combo at the bottom. Yummy. 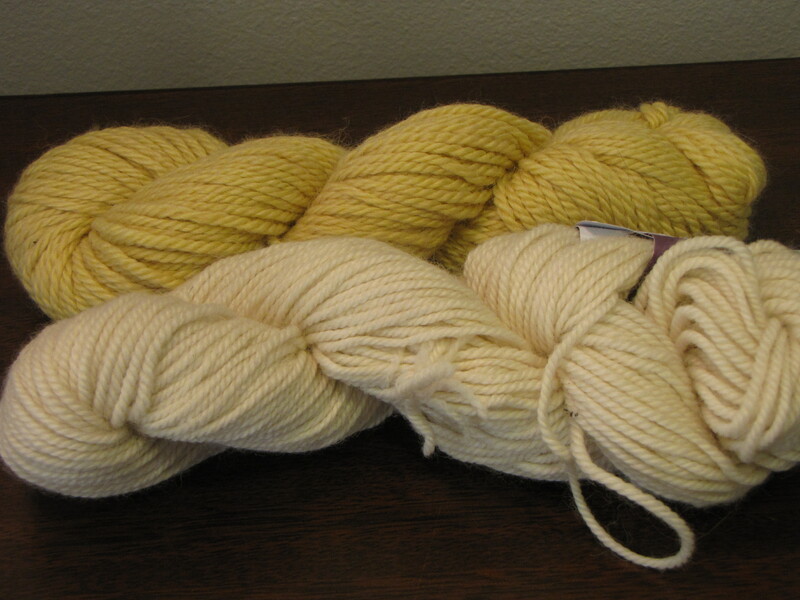 Two skeins of Canopy Worsted: one in Orchid and one in Cat’s Claw. Two skeins of Noro Cash Iroha in a gorgeous purple color (#61). One skein of Malabrigo Sock in Tiziano Red. Here’s what we always say: the yarn has been stored in airtight containers in my non-smoking, one-cat home since being purchased. Before mailing, I freeze the yarn for 24 hours. Comment on the blog by Tuesday, August 23 at noon EDT for a chance to win: how have other knitters taken care of you, or where do you see knitters taking care of each other? Well, as you are aware, I seem to be in need of some worsted, but am totally smitten with that Noro Cash Iroha in purple. And, due to my TAATTU socks snafu of last weekend, I decided to do a bit more research into what I’ll be facing when I do get my hands on some of the correct string for this project and I worry that perhaps I won’t be up to the heels TAAT. Yes, I’ll admit it: I’m getting cold feet–hence the need for socks! But seriously, I willingly volunteer myself to lighten your load in any way I can and you will. I think I’m going to forge ahead with the TAATTU socks once I have the right yarn; if you can read while working on a cardio machine, I can do these socks. Last year when I first started knitting (basic knit/purl while using a death-grip on my needles for fear of slipping a stitch), I went to my LYS just to look around. They were having a Knitogether so there were several ladies there knitting and chatting while sitting in comfy chairs. I just knew I wanted to sit with them.. the projects they were working on were all lacy or socks (these ladies all knew how to knit — and well!). Any way.. long story short, they convinced me to push past my fears and take on a challenging project knowing that they are there if I run into any problems. Now I can knit lace with confidence and no longer worry about dropping stitches since I can fix them myself! Well, I don’t know any stories about knitters helping each other, but I’ve had pleasure to buy from an awesome yarn seller in the US. They helped me to order some discontinued and thus rare yarn from another store which didn’t ship to my country, and were very nice overall. I’ll be ordering from them again sometime in the future. Kathleen, I was suddenly reminded of a film I hadn’t seen for MANY years, The Red Balloon (okay, Le Ballon Rouge if you want to get technical). For those of you who haven’t seen this delightful little movie, a little French boy is charmed by a red balloon which follows him around, until some bad boys destroy it. Then balloons all over the city — balloons of every color and size — magically float to the little boy and he grabs them and is lifted up. My point? If for some odd reason you found yourself without enough yarn, just put the word out and I can assure you that yarn from all over the world would find you. No it wouldn’t be magic, but I for one would send you whatever you want because you have been so kind in sharing what you have. I’m sure the other recipients of your kindness would do the same. So never fear — YOU WILL NEVER BE WITHOUT YARN! I don’t really consider myself to be part of a close knitting community, but I think Ravelry is the perfect example of how knitters take care of each other. It brings community to knitters, like me, who had none. I am not commenting to be entered into the contest but rather just to say hello and tell you how much I enjoyed reading this. 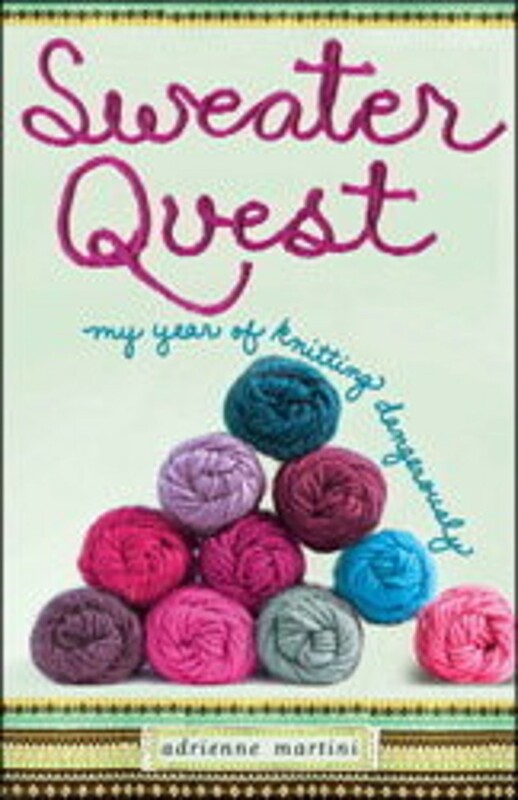 Sweater Quest is a wonderful book (I devoured it last year), and it was fun to read your take on both the book and your stash. Knit Like You Mean it remains one of my very favorite blogs. oooooh, pretty green yarn . . . I just think that knitters are naturally generous – they’ll lend/give almost any materials possible, knowing that they may never see those needles, books, stitch markers or scissors again, but they always get them back, because they’re lending them to KNITTERS. Knitters have helped me in many ways; holding my hand through a tricky technic, swapping stash, and just being really good friends. It is great that Ravelry can help folks find the yarn that they need. I’ve even been able to get other knitters the discontinued yarn from my stash that they need due to Rav. I’ve always seen knitters taking care of each other. From every week at my local knit night where someone gets stuck and someone else jumps in to help. To being at Knit Camp in Stirling last year where despite all the organizational crazy that went on, the knitters attending banded together to have fun. I also saw knitters helping others who had disabilities get around the very hilly campus. It was a moment of being proud to being a community that didn’t think twice about helping it’s own. When a shawl I’d made for a friend was damaged, I had long since run out of the called for yarn. Someone else had the yarn (a hand dyed merino-tussah blend) on ravelry and sent me the 3 yards I needed to repair the shawl! I see knitters taking care of each other on Ravelry all the time. In a group that I participate in, we agreed to a Dr. Who scarf KAL. One of the members of the group couldn’t find one of the colors in her LYS and I found it at mine so I bought the required amount and mailed it to her. I’ve had knitters help me figure out patterns, techniques. Knitters really do take care of our own. How have other knitters helped me you ask? Well, I’d have to say that they save me from compete insanity DAILY! OK, I’m a little insane (who isn’t?) but if it weren’t for my KC (Knit Club) friends, with whom I spend every weekday lunch hour at work, I think I’d be a big mess curled up in a fetal position on the floor, any floor. We talk about happy times and sad times and husbands and children and pets and bosses and patterns and YARN – always! We’ve taken knitting train trips (KC love train to Santa Barbara) and made many hats for preemie babies. We’ve brought lunch to a member who was home sick and yarn-bombed each other’s work areas while the other person is out, so that they had something warm and yarny to come back to. I’ve never known any other people that are as diverse, warm, compassionate, and loving as knitters. I love them all! I guess you could say we’re very closely knit together. I recently went to Sock Summit 2011 in Portland by myself. I didn’t know anyone. At the airport I met Lucy Neatby and a couple of other knitters all buying tickets to ride the Metro into downtown. We rode the Metro together and got to know each other a little bit and they helped me orient myself to the wonderfulness of Portland and the SS. Later I went to dinner and lunch with knitters I had just met and all in all, had a wonderful time at SS. Knitters welcome you to their circles and make you feel comfortable no matter where you are. Ravelry is also such a friendly place to hang out. I’ve learned so much on my projects through the knitters in the various groups. Knitters are always willing to help other knitters and are generous with their skills and time. just recently i started a project which i needed tons of sock yarn scraps to make ..the only thing is im not a sock knitter and i really dont have anything left over in my stash ..so i messaged a woman who i saw on a destash thread who had tons and tons of sock yarns for sale..i payed her a tiny sum of money and she sent me two bags of the most gorgeous yarns ever….they were hardly scraps really and most of them were indie dyers..(she could have easily sold the stash for 3 times the amount i paid) i almost died! it was the nicest thing a knitters ever done for me!…that noro is so pretty..i have such a soft spot for purple..that rowan is also lovely for color work.. This is a little different from the other comments, but I love seeing how people connect in the Rav groups. One group I belong to has an ongoing random acts of kindness thread, where posters sign up to secretly send someone else a little surprise–without any promise of recompense. Another group I joined after a miscarriage is devoted specifically to helping people find community and healing, and the support I got there was overwhelming. Knitters are lovely people. I am lucky to belong to an incredibly supportive group of knitters/crocheters and meet once a week. We are always helping each other with difficult charts or tangled yarn. We share supplies and pet sit or babysit for each other. We have sent bouquets to hospitals and celebrated birthdays. We have also sent a care package to a member who is currently deployed. We’ve discussed charity knitting and celebrated birthdays. I ❤ my knitters!! Thinking about my knitting buddies… we’re all so far from home and family, they’re like a second family to me. I have no doubt that you’ll find a friendly bunch of knitters who help you settle in to your new life. My sympathies on packing and moving bit… such a stressful time. Even though you know it will take longer than you think to get everything organised, it always surprises me how long it ends up taking. It is wonderful that you have something to look forward to already in England. I don’t really need to add to my stash, but that purple Noro has made me go weak at the knees… So pretty. A new place means new yarn shops and new knitters to knit with. They are there. Love all the yarn! Not even moved yet and (deservedly) hobnobbing with the upper echelon! They are so lucky to be welcoming you into their midst. Have a great time at the retreat – what a pleasant way to relax after the move. And no doubt a wonderful opportunity to rebuild stash 😉 At the very least, you can ask around and get an estimate of just exactly how much yarn might be in England. Thank You so much for the Joshua Tree – I’ve been entranced since the first post back in Februrary. That’s such a warm, comfy colorway. Such pretty green Rowan. Green is a color I always think I’m not fond of, then always seeing shades I like. I don’t understand it, and I don’t fight it anymore! To the yet-to-be-chosen winner of the Canopy: You are in for such a treat! I love mine. I’d love to go to Pembrokeshire, and it’s only an hour down the road from me! Unfortunately finances prevent me from going this time (although I’m working very hard on a lottery win, so never say never) but I hope to hear lots of good things about it from you. Oh, and wave at Cardiff as you pass! Love the Noro… it is a regal, luxurious color! I followed a tweet by @knitsib to find your blog — and was pleased to see you were in Alexandria — like me (always on the watch for local knitters)…then I read the post to find you’re heading to England. Ah well! I love London and will live vicariously through your move. Enjoy the retreat!! My friend Eloise was old-enough-to-be-my-mother’s-sister yet became one of 7 similar aged and enduring friends I treasured from Church. Eloise offered to knit/crochet a lovely collar once but foolishly I never pursued the gift. While she was a fine example of a crafter using yarns and her husband faithfully hunted garage sales for supplies it was her other qualities which richly shaped me. We met when I was 22. Over a period of 25+ years Eloise provided me with confidence, encouragement, prayers, hope, and love. She passed away a couple of years ago; while I deeply miss her and sorely miss not having a tangible piece of her handiwork WHAT she did provide for my soul was and will always remain priceless. I am a new knitter …. a year or so not more. I learned to knit all alone 😦 ….. so I don’t feel as though I am the best choice for a teacher, because of my lack of expierence. However I had a friend who expressed an interest in kniting, long story short I gave her needles and a skein of yarn and taught her two stitches in one style. Since I went to a knitting group,( which my boyfriend called me “Granny” because of) and taught another lady a differnt stitch. I expect that overall she has more expierence than me. Which is why I went to a group because I thought that I could learn from someone. I guess that is how knitters help each other. I find more are more than willing to share the knowledge that they have, it’s like no one has anything to loose. Sweater Quest sounds like an awesome book. How does the story end, BTW? Did she finish the sweater? Thanks for the giveaway. Keeping my fingers crossed. When I was first starting to knit, other knitters online were very generous with their time and sometimes even with their yarn – everyone was very encouraging. Also, one local knitter who I didn’t even meet was talking to my mom about a magazine she was trying to buy for me, and I ended up being given a set of dpns and a copy of Knitting Without Tears by a total stranger. I see knitters taking care of each other all the time on Ravelry. I’ve met so many good friends by offering to help. I sat down by a girl I didn’t know, at Stitches South, who had a messy ball of Classic Elite, and untangled it with her for an hour. Now we’re knit night BFFs. I’ve loaned out my Signature DPNs to people who need a pair. 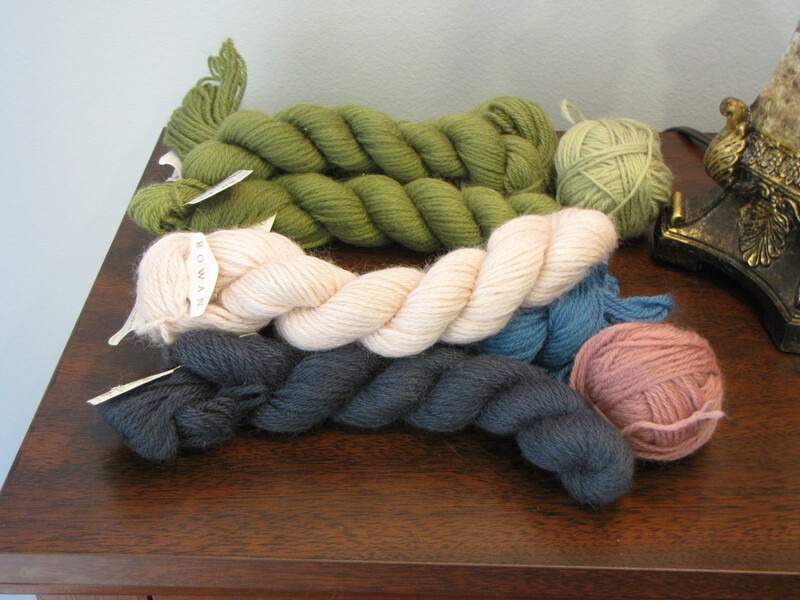 I’ve given up sweet update scores and have sold or given away very dear-to-me yarn, because others wanted it more. And gotten to know Ravelry friends in return. Others have helped me learn to spin, or given me a pattern, or have otherwise gone way out of their way for me (looking at you, The Knit Girllls), and we’ve met that way. It’s about the knitting, glorious knitting, but also very much about the people. I actually became a knitter because of my online friends! After finally expressing an interest into turning to the dark side, one of my friends mailed me my first balls of yarn and a pair of needles. I’ve been hooked ever since. Wow you are awesomely generous! Liz, I love this idea! How do you get their addresses without them knowing what you’re doing? I searched the whole country of New Zealand to find a certain yarn that was discontinued to finish my sweater. One lovely lady e-mailed and sold me 10 balls for a very reduced price.